A quadtree is a tree in which each internal (not leaf) node has four children. Consider the following problem: your need to store a number of points (each point is a pair of X and Y coordinates) and then you need to answer which points lie in a certain rectangular region. A naive solution would be to store the points inside an array and then iterate over the points and check each one individually. This solution runs in O(n) though. Quadtrees are most commonly used to partition a two-dimensional space by recursively subdividing it into four regions(quadrants). Let's see how we can use a Quadtree to store the points. Each node in the tree represents a rectangular region and stores a limited number(maxPointCapacity) of points that all lie in its region. Once the limit in a leaf node is reached, four child nodes are added to the node and they represent topLeft, topRight, bottomLeft, bottomRight quadrants of the node's rect; each of the consequent points in the rect will be passed to one of the children. Thus, new points are always added to leaf nodes. 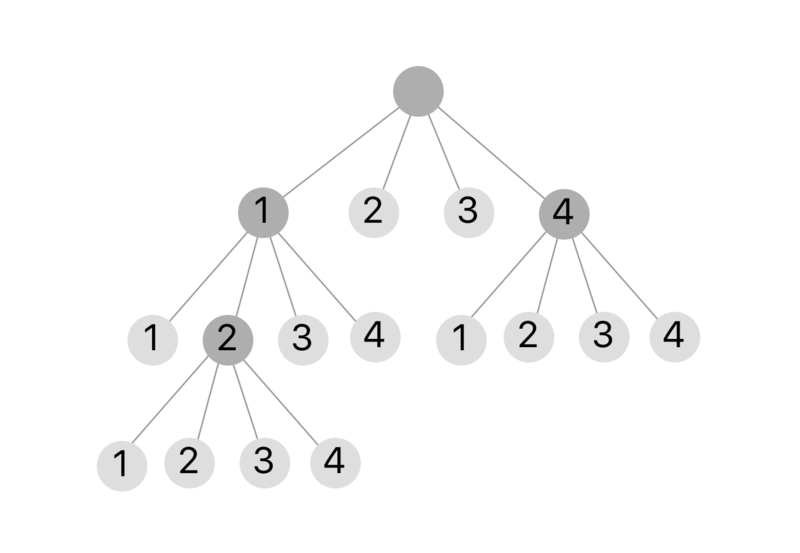 To find the points that lie in a given region we can now traverse the tree from top to bottom and collect the suitable points from nodes. Both adding a point and searching can still take up to O(n) in the worst case, since the tree isn't balanced in any way. However, on average it runs significantly faster (something comparable to O(log n)).